The news hit hard this week: We’re losing Dillard’s. Sad days for the Durham barbecue community. The institution of an eatery, in business since 1953, will open its doors today for the last time. Dillard’s may not have cooked the state’s best barbecue (see the propane smoker in the rear), but it oozed community and served some just-like-you-wished-your-grandma-did cooking (see Porky’s past review). Those who’ve never been can get a sense of Dillard’s through these moving pictures, courtesy of ABC-11. 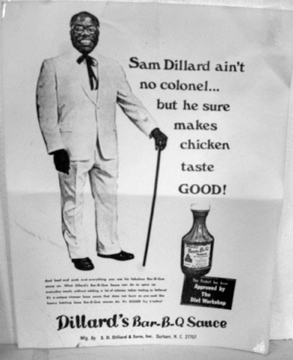 The segment confirms that part of the reason for the restaurant’s closing was that owner Wilma Dillard, daughter of founder Samuel, didn’t want to raise prices on folks in these hard times. That reminded me of the recent ‘cue community rallying around Bullock’s when it became known that Durham’s oldest (1952) ‘cue shack was teetering on the edge. With Dillard’s, we never got the chance. And while I can’t help but wish Wilma had tried raising prices, I respect the heck out of why she didn’t. Instead of mourning the restaurant’s closing, today is a day to celebrate Dillard’s fabulous greens, fluffy hushpuppies and solid barbecue. And did we mention the fried chicken? If you do head over to Fayetteville Rd., tip your cap (and leave a healthy retirement bonus) to a family that has fed all comers for decades, sometimes for free. I recently found out about this awesome Stew ‘n Q fundraiser this Saturday at Durham’s St. Luke’s Church. Then I found out I hadn’t found out recently enough. I was too late–as they ask for preorders, which makes sense–sort of like the BBQ RSVP–but goes against the keep ’em comin’ ‘cue ethic. Then again, on scrolling the site with a hungry eye, you learn that they only “strongly urge” people to preorder to “guarantee” some stew and ‘cue. So…you’re telling me I have a chance?! Anyway, I have a hunch you may be able to take part in this most holy of fundraisers if you head to St. Luke’s later in the day. Should the preorder buzzkill hold true, perhaps it’s best to smoke your sorrows at The Pig. This loving review in The Independent reminds me why I need to go back there pronto. *There is neither Biblical or Talmudic proof to justify this claim, just hot air. It recently came to the Rib Rabbi’s attention (after reading a blog post) that an entire generation of young Americans are being duped. Their rightful inheritance of the noble tradition of barbecue is being bastardized by school board shortcomings and shenanigans. A teacher named, coincidentally enough, “Mrs. Q” is eating school lunch along her students at a midwestern school this year (she’s intentionally vague). She blogs about the experience on Fed Up With Lunch, and in a recent post she reported that her cafeteria served something called “Rib-B-Que.” She’d written about this all-beef patty smothered in cloying barbecue sauce before. Shame on you, lunch ladies! We previously linked to a piece about Scott’s Bar-B-Q in South Carolina. But anytime Joe York, the Leni Riefenstahl of the Southern Foodways Alliance, makes a short film, we try to find an excuse to link to it. Kinda like a chef pickin out his tomatoes in a garden, I pick my own trees fresh out of the woods. Yup. There ain’t no other way. I hate to quibble, but there sure is. It’s just amazing that in a world where cooking with wood is considered by many to be too onerous, Scott regards securing that wood himself as essential. Awesome. Any ‘cue hound has to love this film and the visuals of the coals, the sauce mopping and especially the slow-mo shot of putting the hog on the pit (at the 4:55 mark). It’s hard to watch this documentary and not want to start up the car for the drive to Hemingway to get a few pounds. If I do, I’ll be sure to ask for a piece of skin and to respect the 9:30 a.m. opening time.